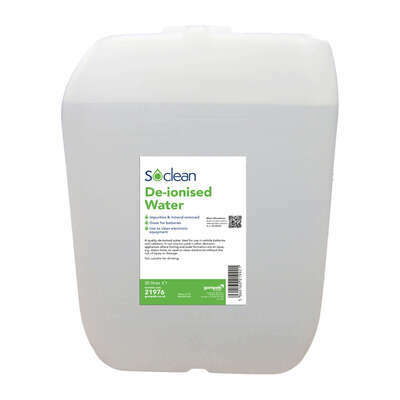 For use in a multitude of professional environments, our De-Ionised Water comes in a large and economical pack size. It has had the majority of normally sourced impurities and ions, such as sodium, iron, calcium and copper, removed. This created the purest water which is ideal for use in vehicle batteries and radiators. It can also be used in other domestic appliances where furring and scale formation are an issue, such as steam irons. In other situations, it can be used to clean electronics without the risk of injury or damage. Our range of Janitorial Supplies is constantly updated with high quality and economic products. Alongside this De-Ionised water, we also stock hardwearing Microfibre Socket Mop Head through to Gompels Orange Multisurface Cleaner - everything your busy company needs.